Lady Constance Read is independent, beautiful, and in need of a husband—now. The last man on earth she wants is the rogue who broke her heart six years ago, never mind that his kisses are scorching hot . . .
Evan Saint-André Sterling is rich, scarred, and finished with women—forever. He’s not about to lose his head over the bewitching beauty who once turned his life upside down. But Constance needs a warrior, and Saint is the perfect man for the job. Only as a married woman can she penetrate Scotland’s most notorious secret society and bring a diabolical duke to justice. When Constance and Saint become allies—and passionate lovers—he’ll risk everything to protect the only woman he has ever loved. Katharine Ashe is the award-winning author of historical romances that reviewers call “intensely lush” and “sensationally intelligent,” including How to Be a Proper Lady, an Amazon Editors’ Choice for the 10 Best Books of the Year in Romance, and My Lady, My Lord and How to Marry a Highlander, 2015 and 2014 finalists for the prestigious RITA® Award of the Romance Writers of America. Her books are recommended by Publishers Weekly, Women’s World Magazine, Booklist, Library Journal, Kirkus Reviews, Barnes & Noble, and many others, and translated into languages across the world. Katharine lives in the wonderfully warm Southeast with her beloved husband, son, dog, and a garden she likes to call romantic rather than unkempt. A professor of European History, she writes fiction because she thinks modern readers deserve grand adventures and breathtaking sensuality too. For more about Katharine’s books, please visit her website or write to her at PO Box 51702, Durham, NC 27717. I ’ve read every one of Katharine Ashe’s books and have been anticipating this one for several years; it may well be her best yet, and was completely worth the wait. The heroine, Constance, is the daughter of the Duke of Read and the only female member of the Falcon Club—the secret government organization that seeks and finds people who are missing and must be recovered discreetly. Six years ago, she fell in love with Frederick Evan Chevalier Saint-Andre Sterling (“Saint”) and he with her. He is a poor soldier and the son of a merchant—not nobility—so social standing prohibits their alliance. Their initial romance is very “Aragorn and Arwen” or “Beren and Luthien”: it’s sudden, forbidden, and its main setting is early morning at the edge of a wood. Those scenes are very elven and romantic—like Saint’s otherworldly green eyes. In the present, six years later, Constance has recently undergone a trauma. Part of her coping with that trauma is an investigative mission—finding girls who have mysteriously gone missing in the environs of Edinburgh. Re-enter Saint, who plays a gorgeous supporting role for Constance’s person and current project. Saint is the rare hero who has nothing to prove: his skill, strength, gentleness, kindness, confidence, and humility are all of a piece. He’s also a master swordsman. With nothing to prove. (!!) And of course, he and Constance have never fallen out of love with one another. By the end of the book, I felt he and Constance truly deserve one another in the best way. 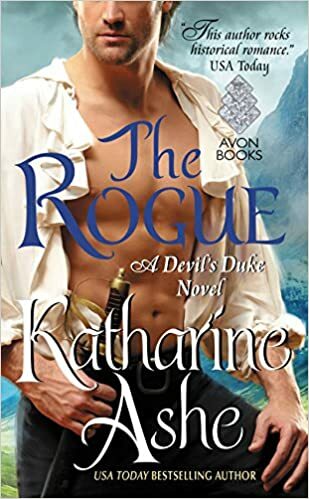 Readers of Ms. Ashe’s other Falcon Club books won’t want to miss this one; Constance appears in each of those as well as in In the Arms of a Marquess (Rogues of the Sea), which immediately precedes this book chronologically. Those who enjoyed I Loved a Rogue: The Prince Catchers(and the deleted scene from that book found here on Ms. Ashe’s website. will already have met Saint and likely fallen in love with him. Additionally, this book begins Ms. Ashe’s The Devil’s Duke series and strikes the right balance between mystery plot elements it resolves and the teasers that leave you wanting more. You won’t be disappointed. This book consumed me. The story builds loosely on the Devils Duke novels. I did not read them in order, but I was familiar with the Falcon Club. Lady Constance always at the periphery as the most beautiful in any room and the most alone because of it. She, very reluctantly, reveals her secrets. Saint is the most romantic hero I’ve read in a long time. He is patient, kind, giving her all the room she needs to grow into this brave, fierce, warrior woman. Instead of contrived and misplaced love scenes, MS Ashe draws the reader into the romance, one fine nuance at a time, one longing look, each giving up a little until their love breaks down all barriers. Could not have been done any better. I loved the whole series. This author had my attention! The characters were unique individuals with engaging personalities! I wished there were more books in this serious.